Cost: $4,895 (Includes tuition, all fees, accommodation, travel insurance, food and transportation from Marrakesh to Tafraoute). Airfare from the US to Marrakesh is not included and ranges from $800 to $1200 depending of departure city. Deposit: $500 (required upon registration). BHNSFS reserves the right to cancel the camp if the minimum enrollment is not reached. The full deposit will be refunded or applied to another camp in this case, and applicants will be notified by email by January 1, 2019. Important Dates: Monday, May 27, 2019 at 8:00 AM - Meet at Marrakesh International Airport. This airport has one exit and will meet by coffee shop by the exit. Saturday, June 29, 2019, Drive back to Marrakesh Airport- Earliest you can fly out is 3:00 PM. Location: Field camp will be based in a small town called Tafraoute at the heart of the Anti-Atlas Mountains about 379 km (5 h 13 min) south of Marrakesh Menara Airport, Marrakesh, Morocco and 143 km (2 h 30 min) from south of Agadir Al Massira Airport, Agadir Morocco. We are going to stay in Hotel L'Arganier d'Ammelne: This hotel has been base location for University of Ibn Zohr undergraduate students field trip for a long time. 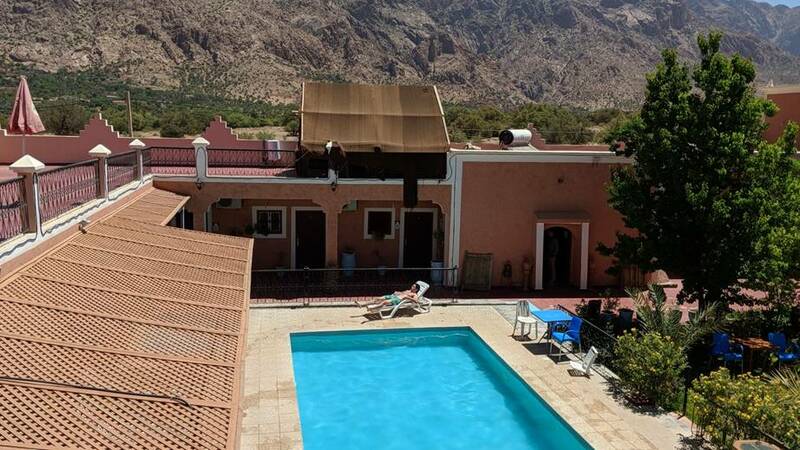 This hotel is very nice, far from the city of Tafraoute and has a beautiful view the Jbel Lkest (Lkest Mountain). It has a swinging pool, a jacuzzi, laundry facility and open courtyard. The manager is very approachable, friendly and allowed us to have the place to ourselves during our field camp. There are 16 rooms in this place, a restaurant with Moroccan food and conference room at our disposal. The Anti-Atlas Mountains extends from southern foothills of the High Atlas Mountains to northwest of Sahar Desert. 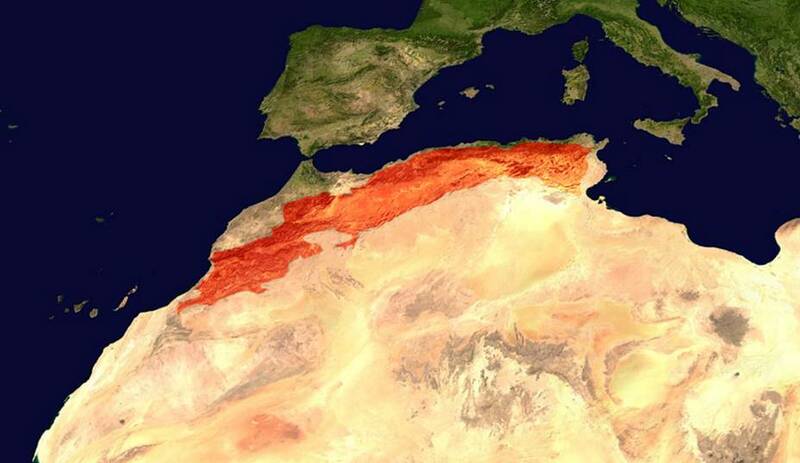 Its climate ranges from arid to semi-arid condition with major influence by orographic effect of the High Atlas and the Atlantic Ocean with annual precipitation ranges from 100 to 200 mm per year. 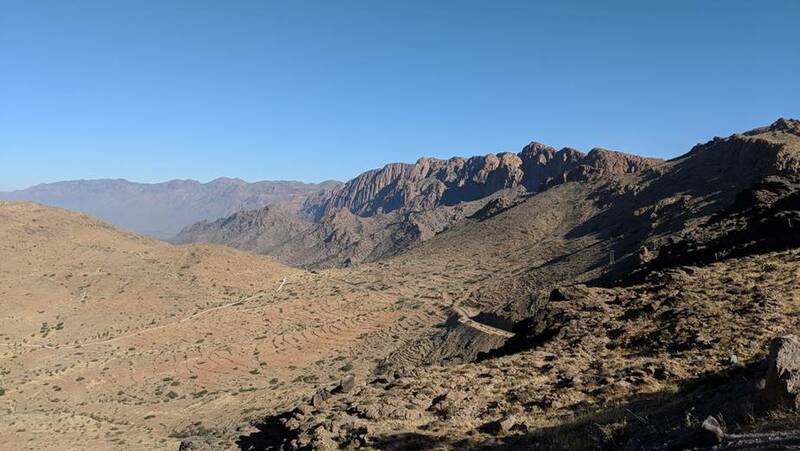 The Anti-Atlas Mountains are part of a mountain chain in southern Morocco which represent the oldest crystalline rocks in Morocco with diversified landscape, made of Precambrian crystalline (Kerdous) and granitic mountains (Tafraoute laccolith) with highest elevation Jebel Siroua (3300 m). This region of Morocco is occupied by Berber-speaking indigenous people with exceptional hospitable traditions. This field camp will be focused on mapping Precambrian metamorphic, igneous as well as sedimentary rocks and early Paleozoic strata. This includes mapping stratigraphic units that record the transition from the end of Precambrian conglomerate and quartzite and Cambrian transgression of dolomite sequences. These sections represent part of the breakup of the Gondwana supercontinent. You will have the opportunity to map sedimentary, igneous and metamorphic rocks as well as complex tectonic structures that built one of the main mountain ranges in north Africa. These rocks are building blocks of the Gondwana supercontinent, onset of the Pangaea supercontinent spreading, and the opening of the Atlantic Ocean and Cenozoic orogeny event. 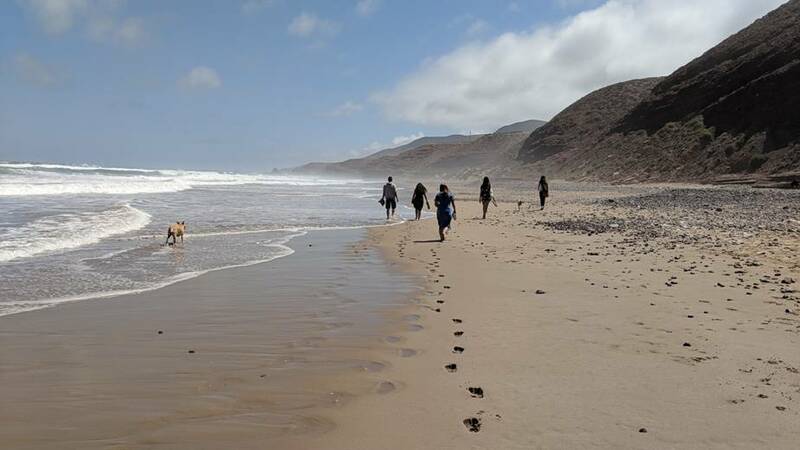 In addition to extraordinary geology, you will have the opportunity to take in the magnificent culture of Morocco through local and regional interactions coordinated by the Moroccan-native instructor. Physical demands: We will be hiking and walking for most of the day and this requires you to be in good physical shape and good health. Climate: Moderate to subtropical, coastal regions are cooled by breeze from the Atlantic Ocean and the Mediterranean Sea. To the interior, hot temperatures during summer and cold in the winters. More arid climate to the south at the foothills of the Sahara Desert. · Field Notebooks for taking field notes, recording evening lectures, etc. · Bring your own personal laptop computer (used for word processing – writing report). Geographic location of Atlas Mountains. The chain extends from the Atlantic Ocean to Tunisia, north Africa. 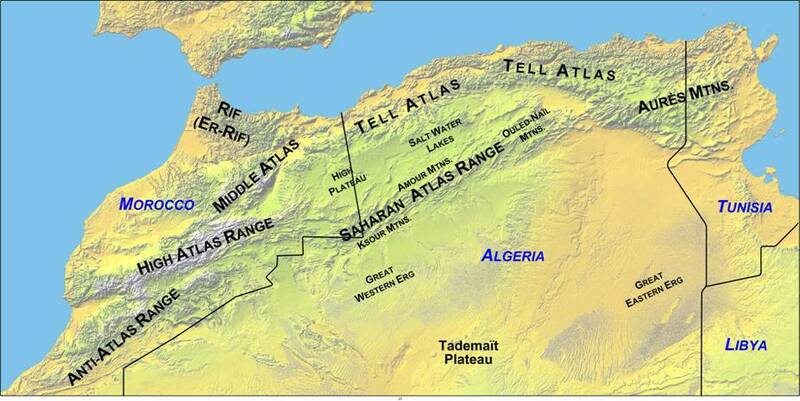 Topographic relief map of Atlas Mountains and its different subdivisions in north Africa. 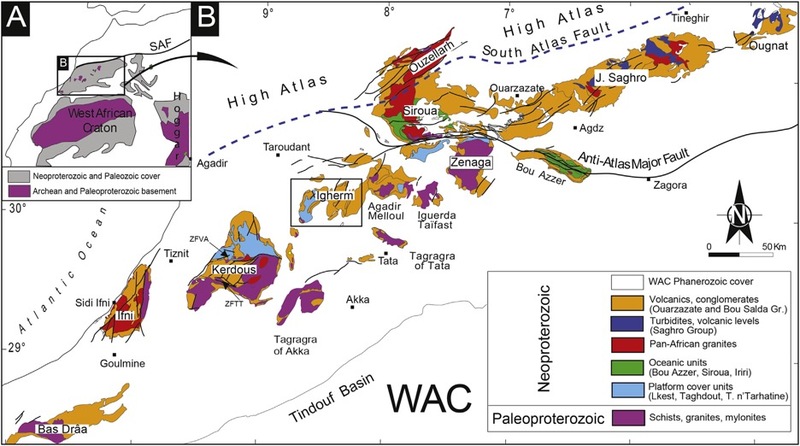 Geological map of the Anti-Atlas Mountains and its relationship to west African Craton Ikenne et al., (2017). 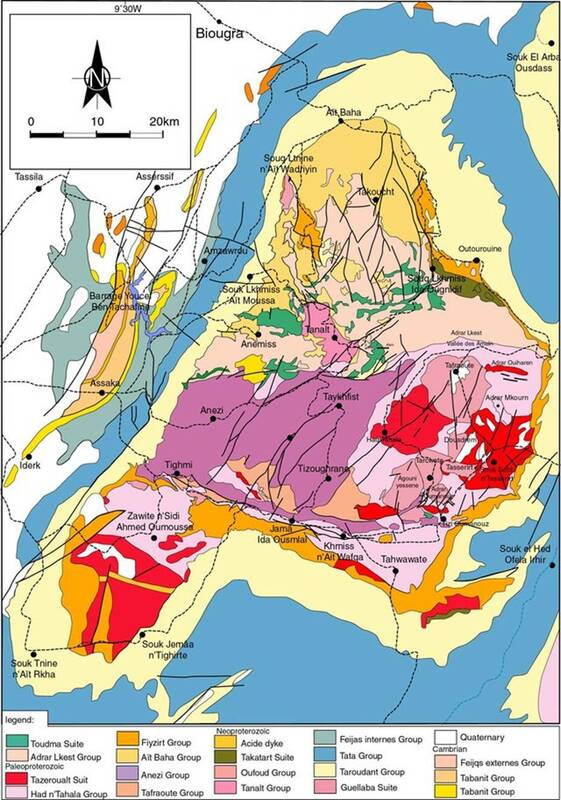 Geological map of the Kerdous Inlier (Soulaimani and Ouanaimi, 2011). Geological cross-section of the lower Cambrian units (Choubert, 1952).